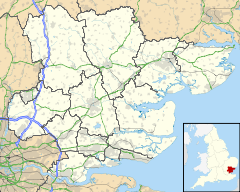 Bardfield End Green is a hamlet in the Uttlesford district of Essex, England approximately one mile east of Thaxted. It is the home of Thaxted cricket club. Wikimedia Commons has media related to Bardfield End Green. This Essex location article is a stub. You can help Wikipedia by expanding it. This page was last edited on 16 February 2019, at 14:00 (UTC).